I am literally horrible at keeping a posting schedule! This is officially my first post of April, and I am already so far behind. It's so annoying because I have so many reviews that have been backlogged for months now. 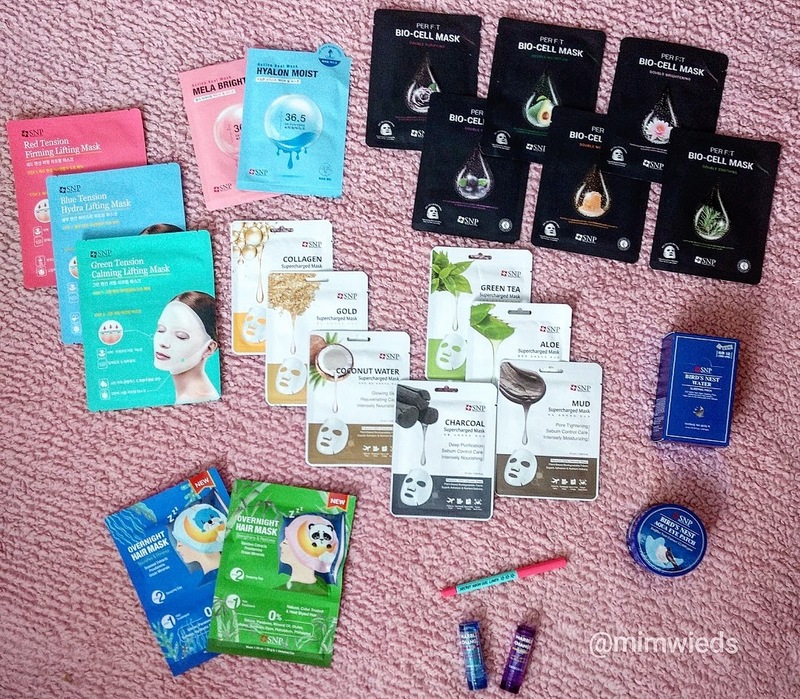 I officially used 40 sheet masks last month, which I think is a personal best! As always, I aim to use at least 1 sheet mask per day, but if I have the time to sheet mask twice a day, I always take the opportunity to test out a new mask. I always recommend sheet masking as much as possible. It is a fantastic way to provide your skin with an intense dose of hydration. The benefits of using any sheet mask include glowing and hydrated skin, but you can choose masks with additional benefits as well. Since I now have normal skin, I am able to use a wide range of sheet masks. However, depending on your skin type, you may want to stick to certain sheet mask varieties. For example, if you have dry skin, you may want to use sheet masks that provide extra hydration. 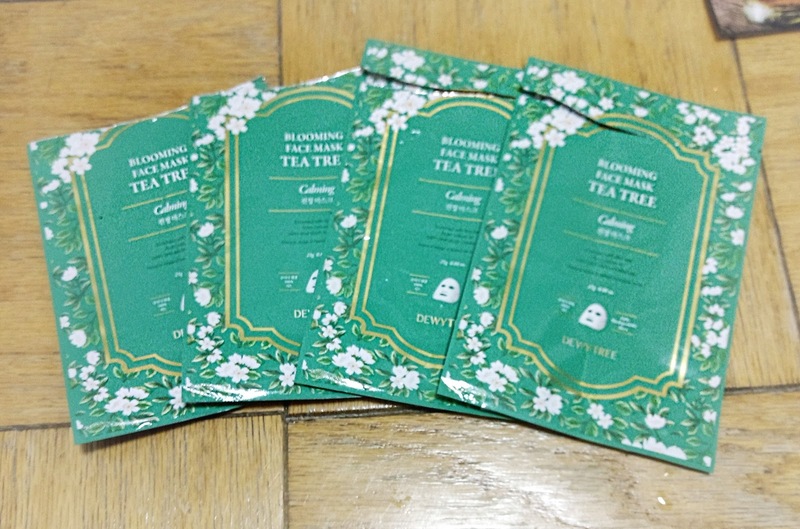 Dewytree Blooming Face Mask in Tea Tree (x4)- I have been absolutely loving sheet masks with tea tree extract. It is so soothing, and it really helps keep breakouts away when I use foundation. Dewytree makes fantastic sheet masks, and the Blooming Face Mask line is perfection. The sheet is really breathable and it is completely soaked in essence. I highly recommend this mask for all skin types except dry skin. 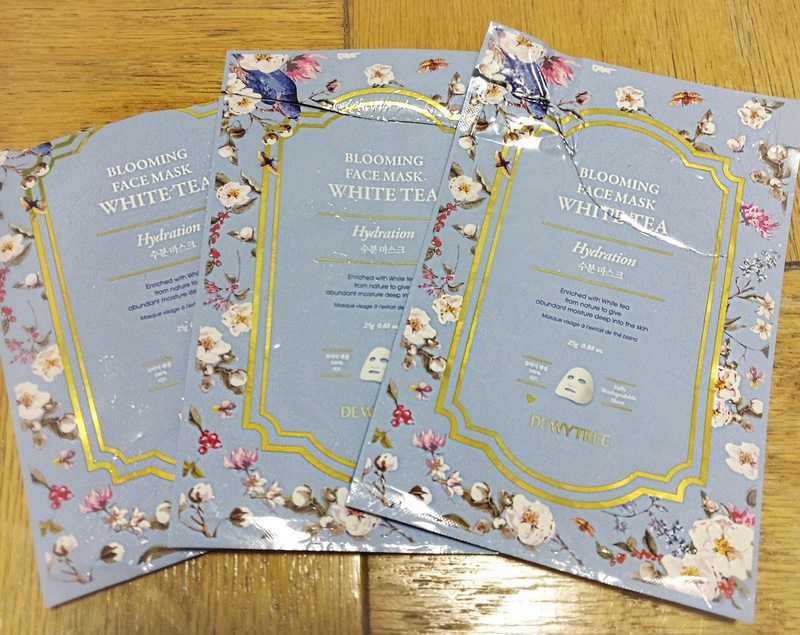 Dewytree Blooming Face Mask in White Tea (x3)- Another great sheet mask from the Blooming Face Mask line. This mask provides an extra boost of hydration as well as anti-aging benefits. This is a great mask to use when your skin needs extra soothing, and it is especially perfect for dry and mature skin types. 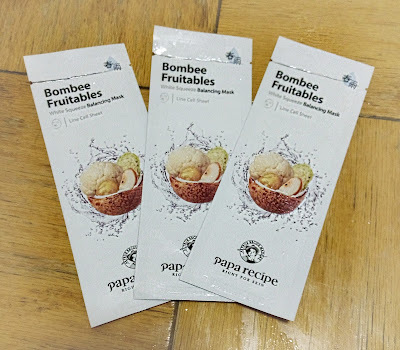 Papa Recipe Bombee Fruitables White Squeeze Balancing Mask (x3)- If you are looking for an affordable sheet mask that will feel absolutely luxurious. the Bombee Fruitables line from Papa Recipe is a fantastic option. These masks are made from high quality ingredients that will do exactly what they claim. The sheet itself will come out SOAKED with essence, so be careful when taking it out of the packet. Fair warning, these masks have a very strong fragrance, so if you are sensitive to fragrance please avoid using this entire line. The white squeeze masks will completely balance out your skin while brightening and hydrating your face. It is one of my favorite sheet masks of all time. 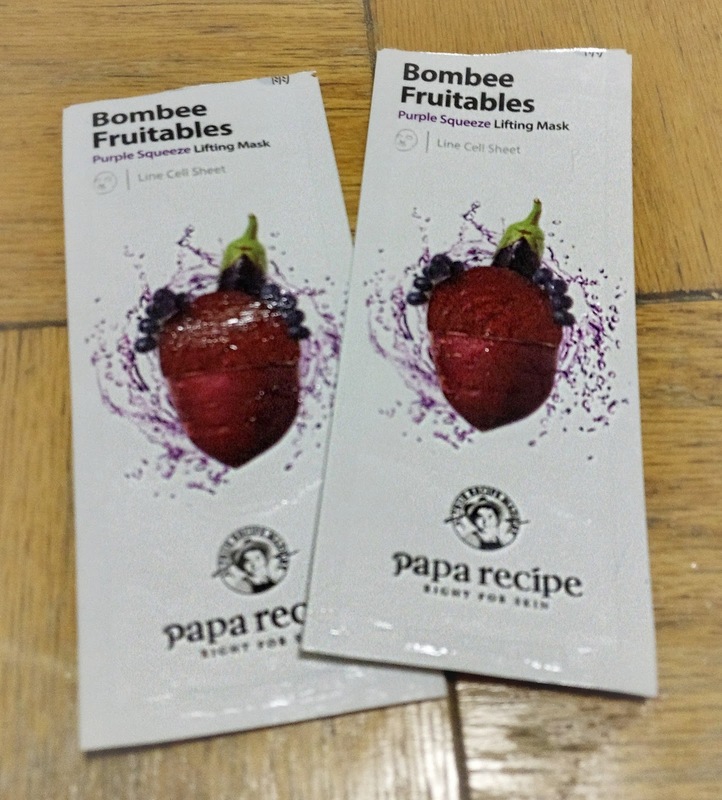 Papa Recipe Bombee Fruitables Purple Squeeze Lifting Mask (x2)- Of course I love all the Bombee Fruitables masks, and I used quite a few of them last month. When it comes to fragrance, the Purple Squeeze masks are super intense. I happen to love when my skincare smells like perfume, so these are one of my favorites. I do feel like my skin looks lifted after using these sheet masks, so I recommend these for mature skin. Papa Recipe Bombee Fruitables Green Squeeze Nourishing Mask- This is the most nourishing sheet mask that I've tried to this date. 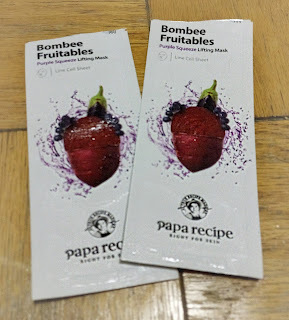 These have the most mild fragrance in the Bombee Fruitables line, so if you hate fragrance but want to try the line, I suggest trying the Green Squeeze masks first. This sheet mask is great for dehydrated and mature skin. 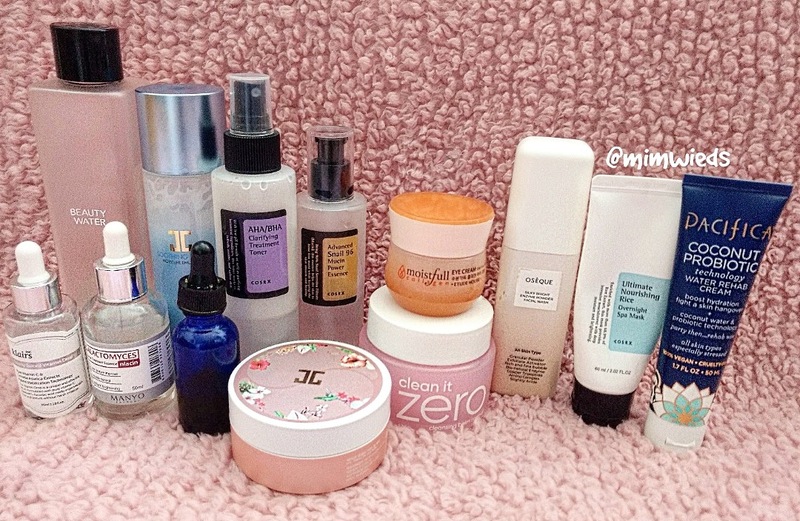 It may be a little too much moisture for oily skin types, so keep that in mind. 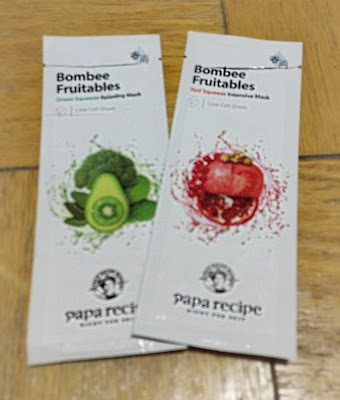 Papa Recipe Bombee Fruitables Red Squeeze Intensive Mask- The Red Squeeze sheet masks are formulated with fantastic ingredients that will improve the quality of your skin. If you are having any type of issue, these will probably be your miracle mask. I think they ate great for all skin types, and the mask will leave your skin looking like glass. Before I finish with the Bombee Fruitables line, I do want to let you know that these are really difficult to unfold. Go slowly and carefully so that you don't end up tearing the sheet! 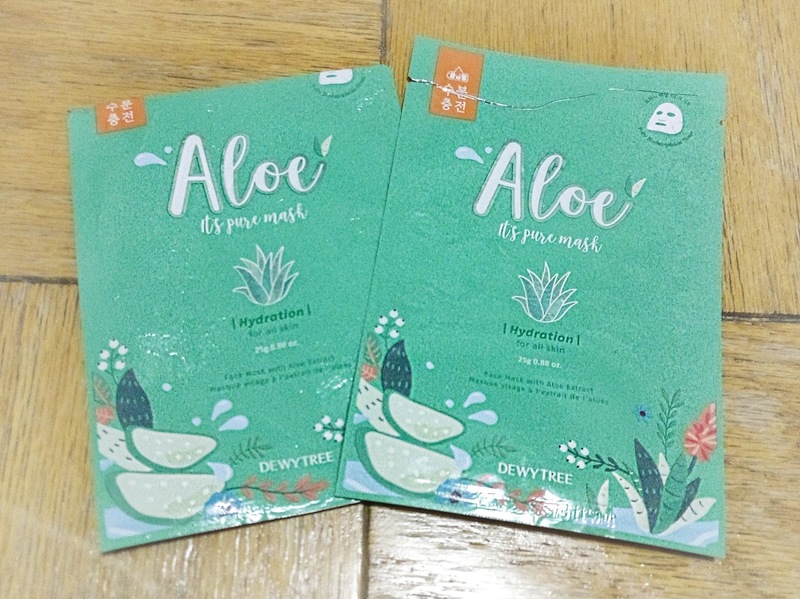 Dewytree It's Pure Mask in Aloe (x2)- As I mentioned above, I really love the quality of Dewytree sheet masks. The It's Pure Mask line is really amazing, but I don't like it as much as the Blooming Face Mask line if I'm going to be honest. I find that the ingredients in the Blooming Face Mask line are a lot stronger than the It's Pure Mask line. However, these are very good sheet masks. They are very gentle, and they do exactly what they claim to do. The Aloe mask is extremely hydrating and soothing. It is great after a chemical peel, day in the sun, or whenever you feel that your skin needs a boost. This mask can be enjoyed by all skin types, including oily skin! Dewytree It's Pure Mask in Rose- The Rose mask is my favorite from the It's Pure Mask line. I happen to love skincare products made with roses, so I knew that I would love this sheet mask. When I tell you that this mask will make your skin glow, I'm not joking. It is one of my favorite brightening sheet masks of all time. This mask is great for all skin types, especially dull skin. If you are looking for that classic Korean skin glow, I highly recommend using this sheet mask a few times a week. 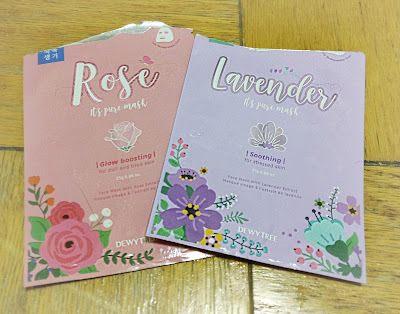 Dewytree It's Pure Mask in Lavender- The Lavender mask is my least favorite from the It's Pure Mask line. It is just a very basic sheet mask in my opinion, and it is way too expensive for what it is. If you already have this mask in your sheet mask stash, you should definitely still use it. It will help soften and nourish your skin. However, I do not recommend anyone buying this sheet mask for more than $1. I just really think that it performs at the dollar level. 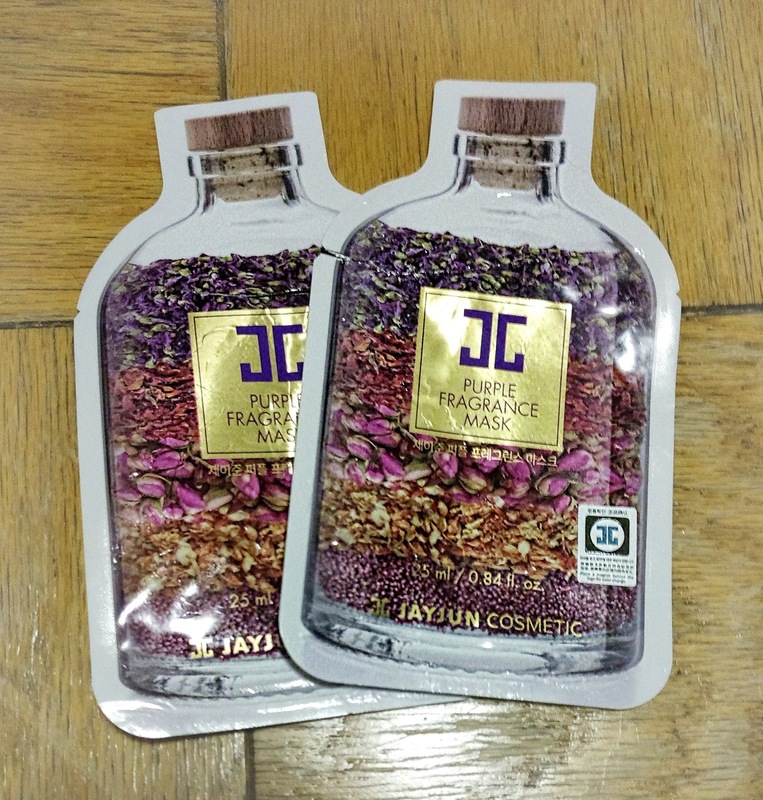 JayJun Purple Fragrance Mask (x2)- I really love JayJun sheet masks, and this one is very high quality. The sheet is very thick, but it feels amazing on the skin. Honestly, I'm not actually sure what these sheet masks are supposed to do for your skin, but the scent really helps with relaxation. It does soften the skin, and it feels very luxe. The fragrance is very overwhelming, which I love, but I know that some of you may be sensitive to fragrance. I highly recommend this sheet mask if you want a mask that will be very relaxing and relieve stress. 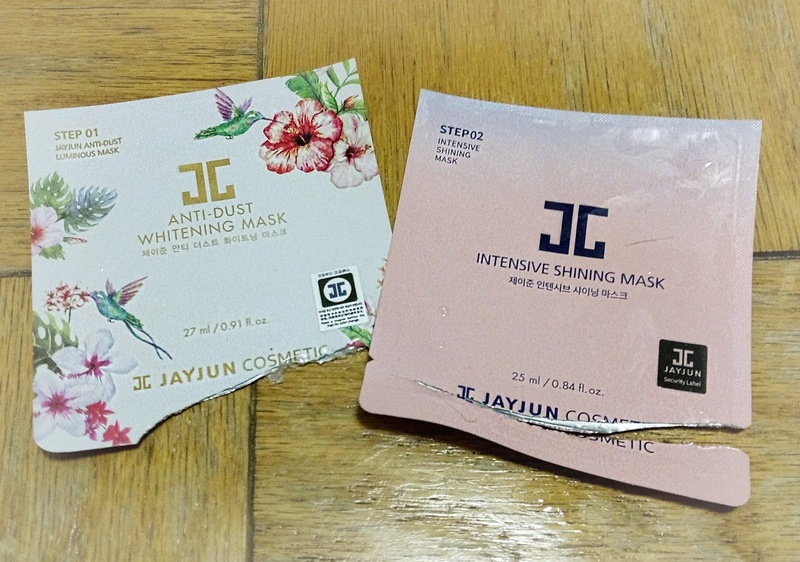 JayJun Anti-Dust Whitening Mask- JayJun sheet masks, actually JayJun skincare products in general, are absolutely amazing. I have loved every single product that I've tried so far, and I can honestly say that the products are worth the high price tag. JayJun isn't the most expensive K-Beauty brand, but they are not exactly affordable to the average person. If you are going to save up some money for JayJun products, I highly recommend the Anti-Dust line. Anti-pollution products are a must for living in large city. As a New Yorker, my skin is surrounded by dirty air. Thoroughly purifying my skin daily is really important to me, and the JayJun anti-dust line is perfect. 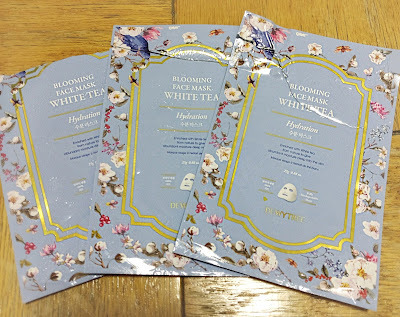 The Anti-Dust Whitening mask is a 3-step mask. All three steps are meant to work together to give you bright and glowing skin. I used this mask once so far, and I saw such a huge difference in my complexion. I am absolutely hooked now. I will be repurchasing this mask ASAP. I highly recommend this mask to anyone living in a large city! JayJun Intensive Shining Mask- I am loving these JayJun multi-step masks, but they are too pricey for me to use daily. I usually save them for when I'm traveling, since they typically include many steps that I don't want to pack separately. The Intensive Shining Mask will literally give you glass skin. After using all three steps, your skin will shine and glow like glass! I feel like this mask is gentle enough to use on all skin types, so this is great news for those with oily skin to get that perfect glass looking glow. 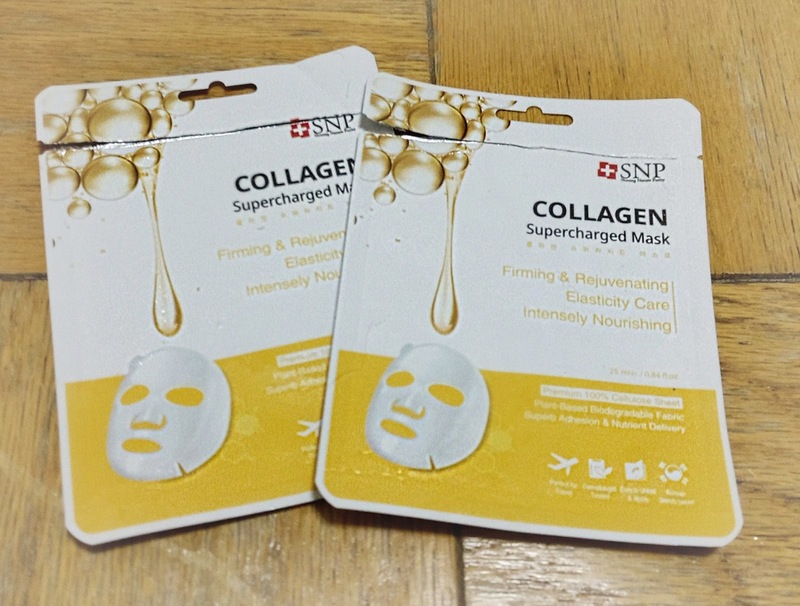 SNP Collagen Supercharged Mask* (x2)- These Collagen Supercharged masks are the first SNP masks that I've ever tried. 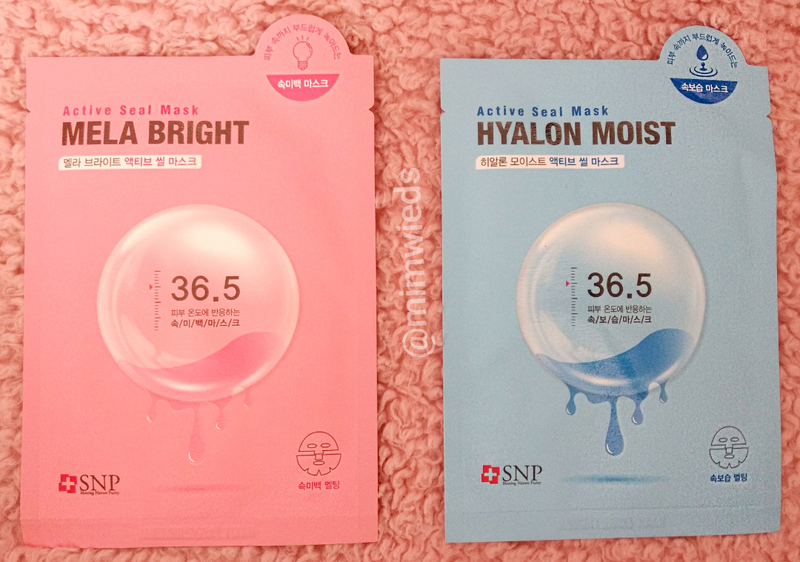 I was sent these sheet masks to review, and I was surprised by how much I actually liked these masks. They definitely made my skin firmer, but more impressively, these masks made my skin so freaking soft! I have since received more masks from the Supercharged line, and they are all very spa like in quality. The sheet is very delicate, but it comes with a mesh protective layer to help you unfold the mask successfully. This mask is great for all skin types, especially mature skin. 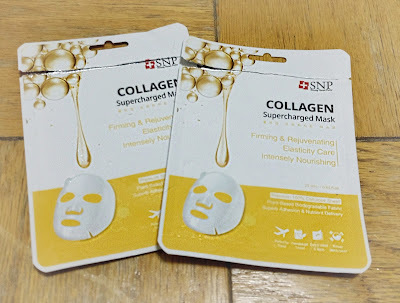 SNP PER F;T Bio-Cell Mask in Double Moisturizing*- After trying the Collagen Supercharged Mask, I was really excited to receive a whole box filled with SNP sheet masks to review. The Bio-Cell Mask line looked that fanciest, so of course I had to try them out first. The sheet masks in this line are made of a rubbery material that can tear very easily. The sheet comes sandwiched between two mesh sheets to help with the unfolding. The sheets are surprisingly saturated with essence, which is hard to believe based on the material's gel-like consistency. The Double Moisturizing mask smelled very much like honey, and it really did moisturize my skin. It felt nice on my skin after an intense exfoliating session. This sheet mask is fantastic for all skin types, especially dehydrated/dry skin. 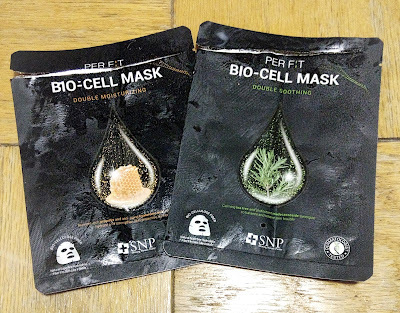 SNP PER F;T Bio-Cell Mask in Double Soothing*- I'm always excited to try a new tea tree mask. The Double Soothing mask from the Bio-Cell Mask line is a really great for keeping your skin clear. I think they work really well, but I don't think they work any better than any other tea tree sheet mask. This mask is great for acne prone and/or troubled skin. Ultru I'm Sorry For My Skin Jelly Mask in Revitalizing- I honestly bought these sheet masks for their cute packaging. 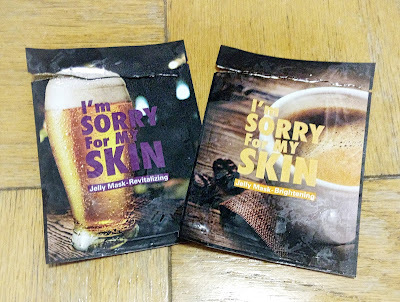 I mean, who wouldn't buy a sheet mask with a beer on the front???? Unfortunately, these masks were not at all worth the money. The essence was an interesting jelly texture, but they really didn't do anything special for my skin. All I noticed was some hydration, but I can get that from a dollar mask. I had really high hopes for this line and brand. I was seeing it pop up on Instagram with rave reviews. They just weren't for me. Ultru I'm Sorry For My Skin Jelly Mask in Brightening- I'm going to say the same thing about this mask. These sheet masks are really great for hydration... but that's it. If any of you tried this brand and line of masks, please let me know about your experience! Leegeehaam Deep & Quick Mask Tone-Up Care- These Deep & Quick Masks have been my favorite hydrating masks for a long time. The sheet is thick and over saturated with essence. If you need a huge dose of moisture, these sheet masks are perfect. The Tone-Up Care version will also make your skin glow! The only skin type that should avoid this mask is sensitive skin. The brightening ingredients are quite strong in this mask, and I do feel some tingling when I have damaged skin. Leegeehaam Deep & Quick Mask Firming Care- The Firming Care mask from the Deep & Quick Mask line is perfect for mature skin. It will provide an insane amount of moisture to plump the skin, and it will firm the skin at the same time. If used on a regularly, these masks will be able to give your skin a beautiful youthful glow. I have repurchased this version so many times already. It really is a fantastic sheet mask. 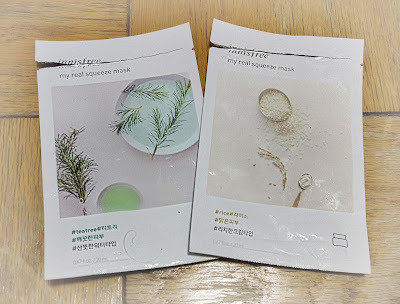 Innisfree My Real Squeeze Mask in Tea Tree- I am pretty new to Innisfree sheet masks. The My Real Squeeze Mask line can be found for as little as $1, so it is a perfect option if you are new to daily masking. It is also a great option to keep your sheet mask stash well stocked for more seasoned maskers. This mask is very basic, but it will provide some moisture and additional benefits depending on the highlighted ingredient on the packet. The Tea Tree version feels very cooling on the skin, and it will help keep your skin clear and smooth. Innisfree My Real Squeeze Mask in Rice- The Rice sheet mask from the My Real Squeeze Mask line will help a lot with brightening. My skin looked radiant and felt very soft after using this mask. I recommend this mask to all skin types, including sensitive skin. It is super gentle, and it is made from fantastic ingredients. I do love using products with rice extract or rice powder regularly. It really helps keep my skin smooth and bright. This mask is super affordable, so you can use it 3-4 times a week without breaking the bank! Manefit Beauty Planner Mask in Mugwort Astringent + Pore Care- I have been seeing the Manefit Beauty Planner Masks around Instagram, and of course I had a serious case of FOMO. When they went on sale, I purchased the entire line for $2/mask. I didn't want to pay full price since I had never heard of the brand before, and I wasn't sure how effective the masks would be. These masks turned out to be absolutely amazing! I couldn't believe how soft and smooth these masks made my skin! The Mugwort Astringent + Pore Care version helped sooth and clear my pores. Mugwort is huge trend in K-Beauty skincare at the moment, and for a very good reason. This ingredient provides the benefits of Centella and Tea Tree, but it is so gentle and works very fast. I highly recommend this mask to all skin type, including sensitive skin. Manefit Beauty Planner Mask in Lily Whitening + Brightening- The Lily Whitening + Brightening mask from the Manefit Beauty Planner Mask line will give your skin the classical Korean glow! It the essence is super watery, and it sinks into the skin so well. I absolutely love these masks, and I think they are definitely spa quality. I think they are only $4 normally, so I will be buying more of these masks. Spa Sundays are my favorite skincare ritual. I triple mask at home, and my skin looks like I received an expensive treatment. My third mask is always a sheet mask, and the Manefit Beauty Planner Mask have been giving me amazing results. If you haven't tried these masks yet, run to buy them now! Mediheal Essential Mask in Tea Tree Care Solution- This is the second box of Tea Tree Care Solution masks that I've purchased. They are my absolute favorite tea tree mask, and they often go on sale. I love the thin sheet, the dripping essence, and the fit of these masks. 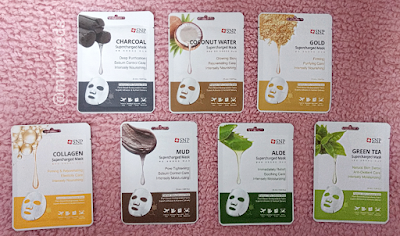 Mediheal makes fantastic sheet masks, and I highly recommend trying a few out. The Essential Mask line has many different varieties, addressing almost every skin concern. These are not super expensive even at full price, so they are great for daily use. Mediheal Essential Mask in Collagen Impact- The Collagen Impact masks from the Essential Mask line is new for me. 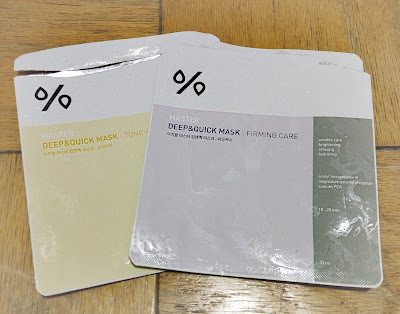 I have tried quite a few masks from the line, and I have not been disappointed yet. 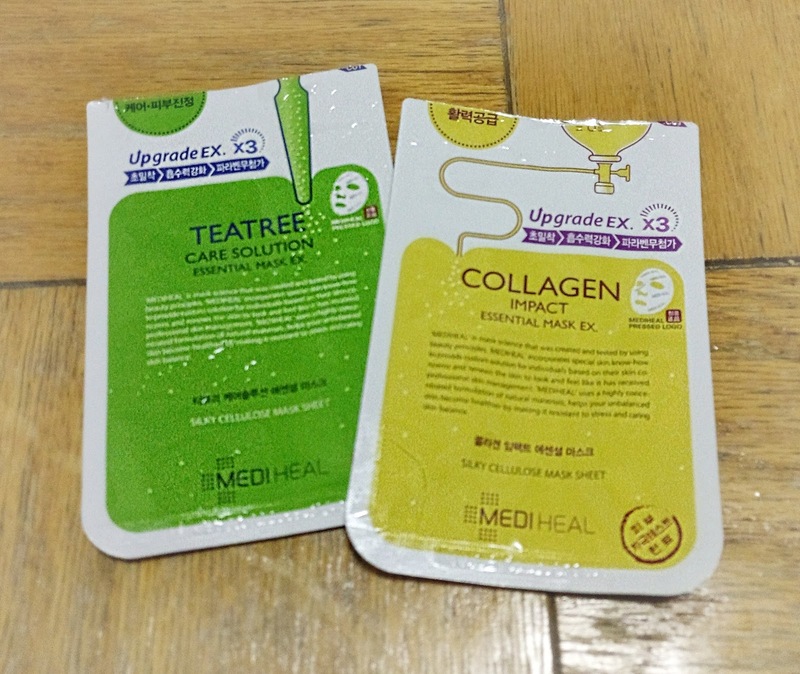 The Collagen Impact mask is very soothing, and it make my skin appear a lot plumper. It is the same quality as the other masks in the line. I am really happy that I picked these up. They are great for mature skin! Kina Function Facial Mask in Hyaluronic Acid- Kina Cosmetics is new for me. I have never heard of the brand before, but the sheet masks in the Functional Facial Mask line looked fantastic. So of course, I bought all the masks in the line. I used the Hyaluronic Acid mask after a clay mask, and it gave my skin the moisture surge it needed. I am super impressed with the quality of this mask, and I can't wait to try the others from this line. Leaders Amino Pore-Tight Mask- The Leaders Amino masks have rave reviews, and I was excited to find the Pore-Tight version on sale for $1. I didn't realize that this mask was meant for oily skin types, since it did not have that description on the website. I have normal skin, but sometime products meant specifically for oily skin dries my skin out. Thankfully, that did not happen with this mask. My pores were super clear and appeared a lot tighter than normal after using this mask. I highly recommend it to normal-oily skin types. 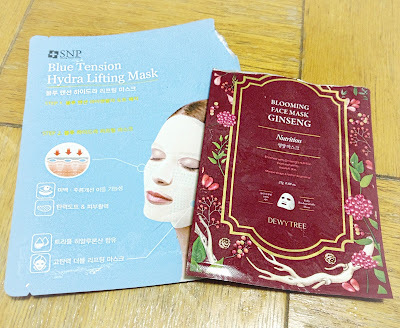 SNP Blue Tension Hydra Lifting Mask*- The Blue Tension Hydra Lifting Mask comes in two steps. The first step includes 4 patches that can be used under the eyes and around the mouth. The second step includes a sheet mask with ear loops. The whole experience was amazing from start to finish. My skin felt pampered and hydrated after only one use. I love the idea of including eye and mouth patches in a sheet mask packet. I highly recommend this mask as a special occasion mask. Dewytree Blooming Face Mask in Ginseng- I'm finally up to the last sheet mask! This took me two days to get through! 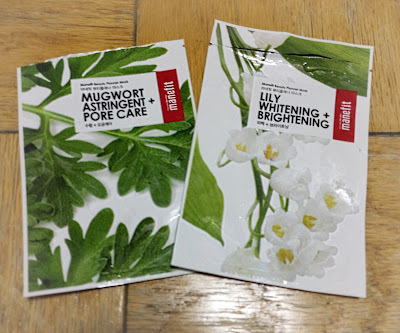 As I mentioned above, I really do love the Blooming Face Mask line from Dewytree. The Ginseng version is no exception. This mask gives my skin a massive boost of nourishing ingredients, and my face always glows for days after using only one mask. I like to use these once in a while just to keep my skin in fantastic shape. I highly recommend this entire line! Wow! I'm completely exhausted right now. I need to start breaking these posts up into two parts, but that might be annoying to read. If you made it until the end, you are a superstar! I really appreciate all my readers. I spend quite a bit of time on each post, so I really hope they are helpful. If you have any question, comments, or suggestions for future posts, please leave me a note below. As always, please support my blog by subscribing, following my on Instagram, and following me on Twitter. 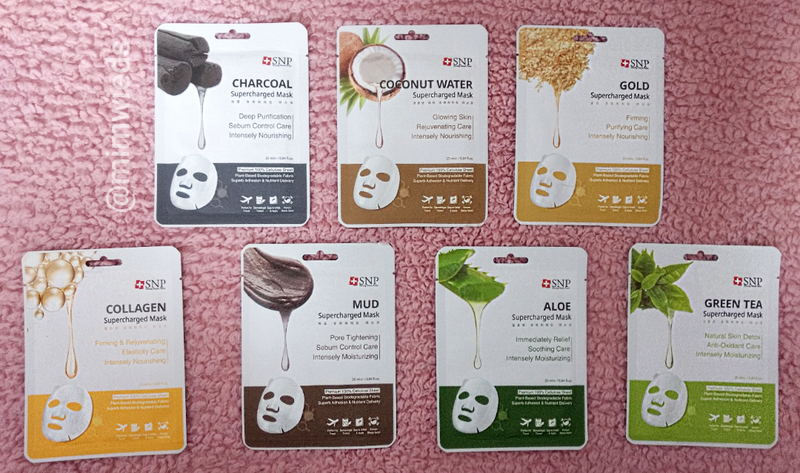 *I received these sheet masks for free to review, all opinions are my own. I don't usually post PR hauls, but I'm really excited about this one that I received from SNP. 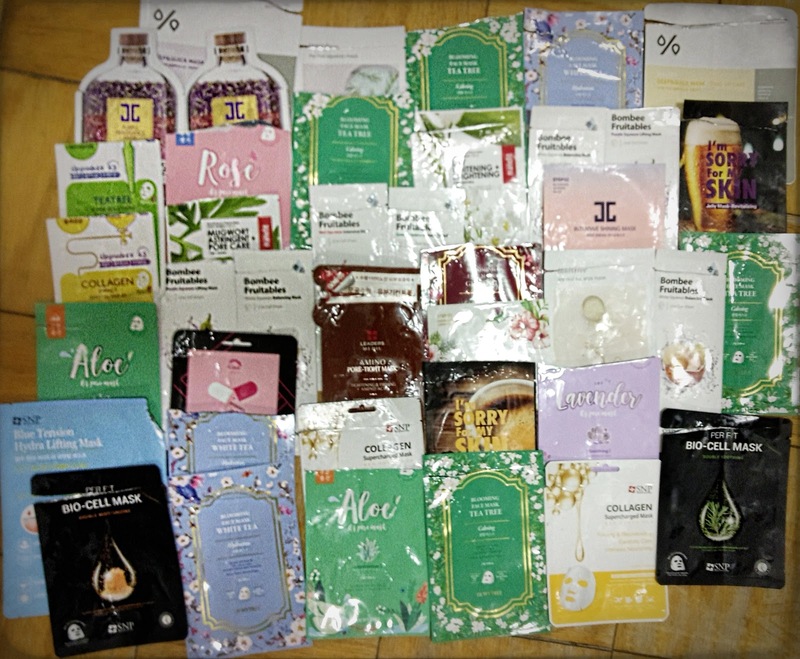 I was sent a total of 36 SNP sheet masks, 4 SNP hair masks, 1 box of SNP sleeping packs, 1 tub of SNP eye patches, and 3 makeup products from the company CeleBeau. 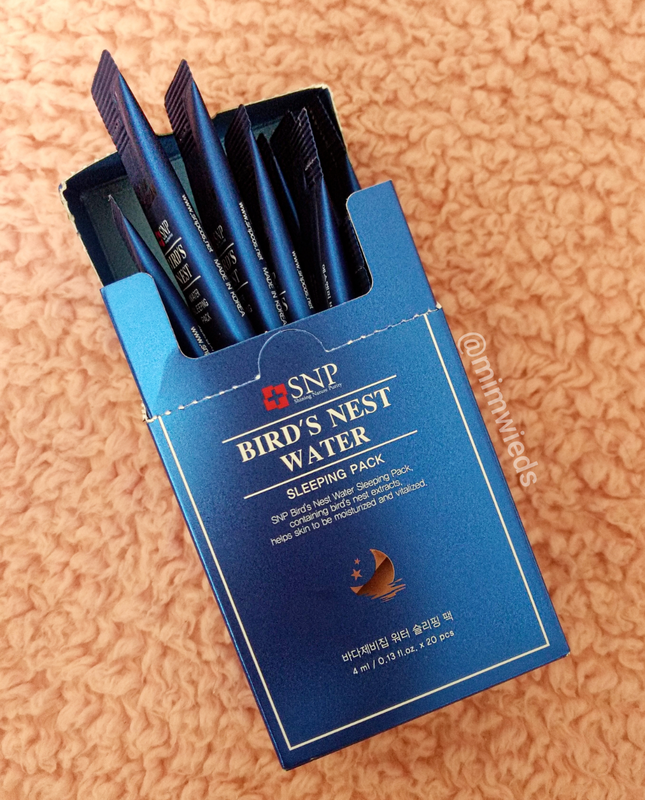 This post will be focusing on the SNP products, but I will be sharing my thoughts on the makeup in a future post. The Supercharged Masks retail for $3 each on the official SNP site. I received 14 Supercharged Masks (2 of each shown above). I already tried the Collagen version before I was sent this PR package, and it was amazing! I'm really excited to try out the other masks from this line. They do also have a Rose version on the website that wasn't included in this package. These masks are made from 100% Cellulose and are supposed to fit the skin well. Overall, this is a great selection of masks that will target every skin concern. I'm super excited to try them all! The PER F:t Bio-Cell Masks retail for $3.60 on the SNP website. I received 12 of these masks (2 of each shown above). This is actually the first time I've seen these masks, so I was really excited to be able to try the whole line. I couldn't wait to try these, so I used the Double Moisturizing Mask this morning, and it was super nourishing. The sheet adhered to my skin effortlessly, but it was a little difficult to apply to my skin. 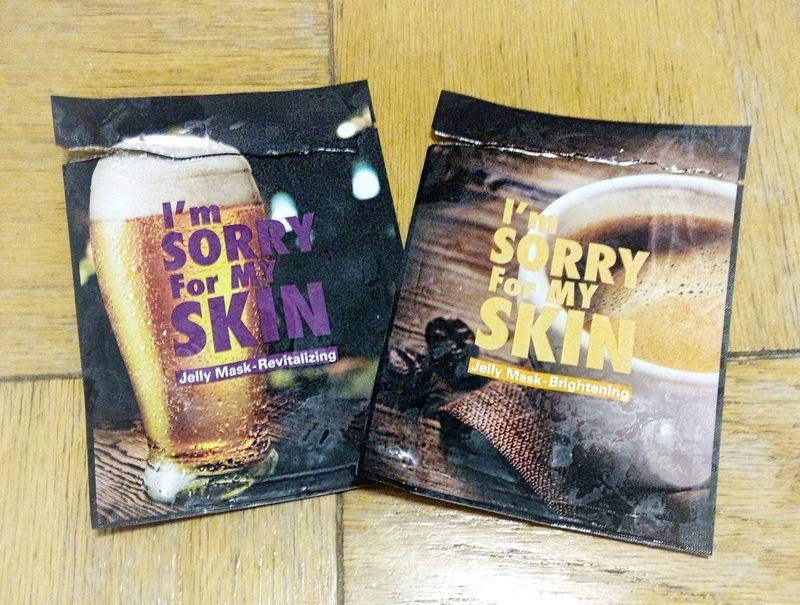 These sheet masks are made of Bio-Cellulose Fiber. The fiber is superfine and hydrophilic. The mask fits skin like a glove. I'm really excited to put this entire line to the test! All of these masks sound absolutely fantastic! 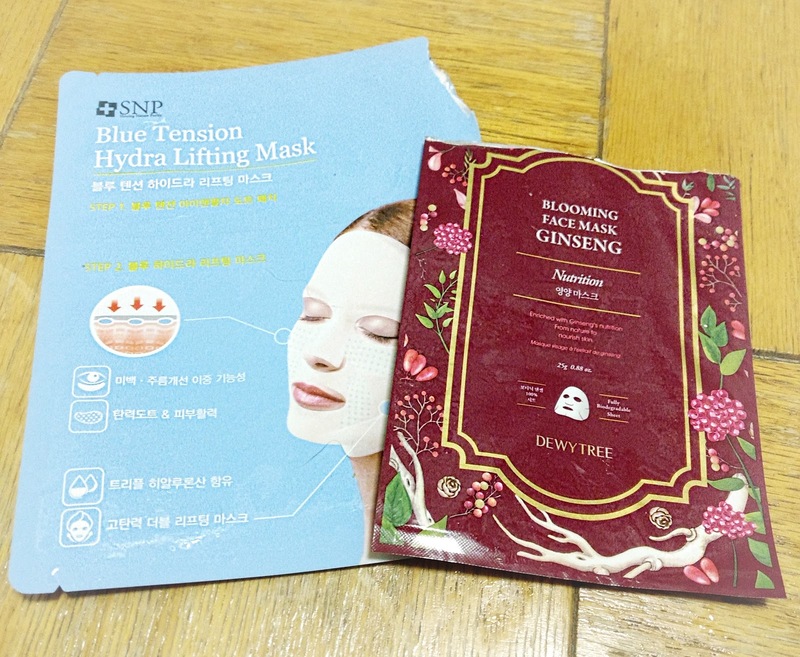 The Tension Masks retail for $5 each on the SNP website. I am so happy that I received the entire tension line! 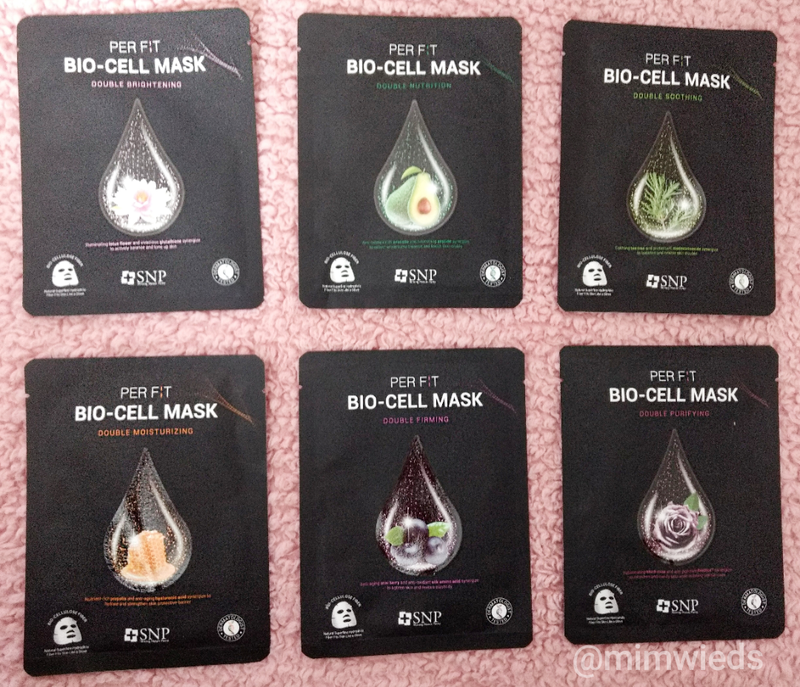 The PR box included 6 of these masks (2 of each shown above). There are three versions of sheet masks in this line, and I already tried out the Blue Tension Hydra Lifting Mask last night. I have never tried anything like this mask before, and it was absolutely fantastic! These are two step masks, and the sheet actually loops over the ears for a tight fit. The first step includes eye and smile line patches, and the second step is an essence/serum soaked mask. Wow! This line is really standing out for me right now. All the masks are formulated with fantastic ingredients. I honestly think these will be my favorite. 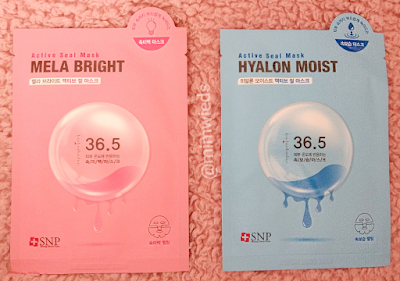 These Active Seal Masks retail for $3.50 each on the SNP website. I was given 2/3 to try, there is also the Pepta Firming mask available that wasn't included in this box. I actually haven't tried these yet, so I you will have to wait for a full review. These sheet masks are made of fibers derived from natural canola. The mask comes in two pieces, which I actually like a lot more than the one piece mask. I find that the mask fits my face a lot better when it comes in two pieces. 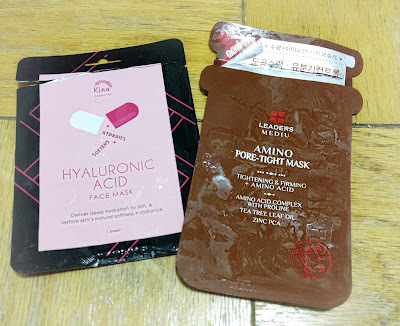 Most of the packaging is written in Korean, so I will just have to try one to see what makes these masks so special. 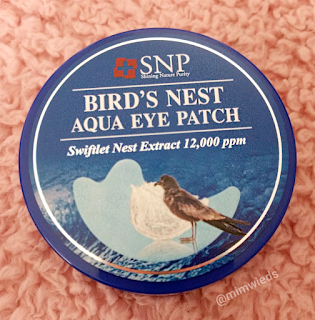 The Bird's Nest Aqua Eye Patches retail for $23 for 30 pairs on the SNP website. I received one set of 60 eye patches in this box. I am really obsessed with eye patches these days, so I'm super excited to try these from SNP. These eye patches sound amazing! I have been seeing rave reviews for these on Instagram, so I'm pretty optimistic right now. I will update you guys in a future full review of this product. I actually can't find this sleeping pack box set on the SNP website. I can only find these on random websites and eBay, so I won't be linking them in this post. I received a box of these mysterious sleeping packs in this pr box, and I am really excited to try them. Most of the packaging is in Korean, so I can't exactly give you guys a features list. I'm going to assume that the benefits are similar to the eye patches since they both contain the Bird's Nest extract and Hyaluronic Acid. I really do enjoy using sleeping packs, so I will be trying these out as soon as I run out of my current sleeping mask. Those are all the skincare products that came in this pr box. I am so excited to review all of these for you, and I hope you enjoy reading about my experiences! If you want to support this blog please subscribe or follow me on social media (Instagram/Twitter). I'm so sorry for the lack of blog posts recently. I have been exhausted and trying to catch up with work. I am excited to be sharing my current skincare routines today! For those of you that don't know, I had a horrible first trimester. I wasn't able to even wash my face at all for like two months! My skin is looking so much better after getting back into skincare. I had a lot of dull skin and closed comedones these last few months, but now my skin is smooth and glowing again. I changed out quite a few products since my last skincare update, so I hope this post is helpful! Pacifica Beauty Coconut Water Micellar Water- I honestly stopped washing my skin with soap + water in the AM. I find that my skin doesn't actually need a thorough cleansing twice a day. I add a lot of micellar water to a cotton square, and just swipe the cotton across my face. My skin feels completely clean from just using micellar water in the AM. COSRX AHA/BHA Clarifying Treatment Toner- To keep my skin clear, I spray this toner three times into my palms and pat the product onto my face. This toner contains a very low level of AHAs and BHA, so it is safe to use twice a day. 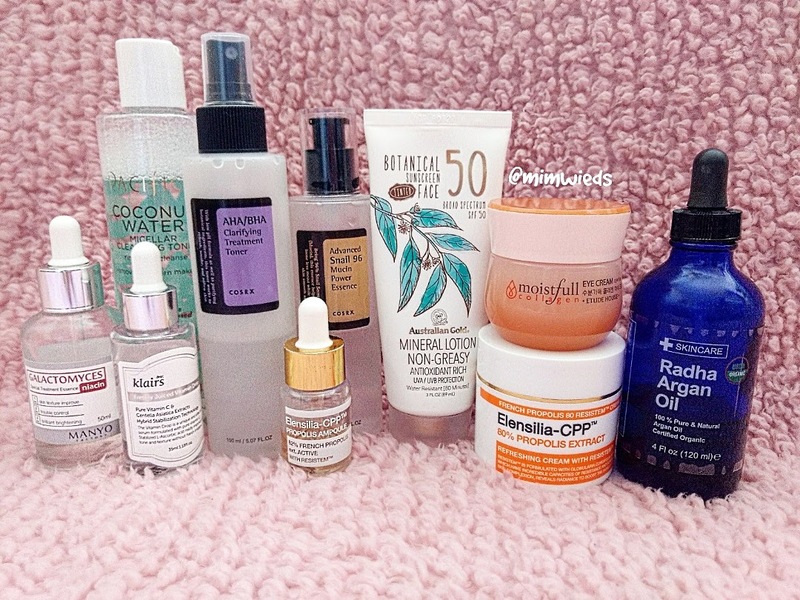 I love to include chemical exfoliants in all my skincare routines, but they can be very harsh. This toner is amazing for daily use! Manyo Factory Galactomyces Niacin Special Treatment Essence*- I have been using this special treatment essence for quite a while now, and I'm actually almost out! This essence will keep your skin absolutely clear and smooth. I use about 6 drops for my whole face, and I use it twice a day. It is seriously very special, and I will have to purchase a new bottle soon. Dear Klairs Freshly Juiced Vitamin Drop- This is a new addition to my routine, and I am loving this Vitamin C serum! It is super gentle, and it is formulated with Centella Asiatica which is ffantastic for almost every skin condition. I have been wanting to try this serum for quite a while now, and it has definitely lived up to all the hype. I have seen some negative reviews for this product, so please be aware that this may not work for you. Sheet Mask- This is when I will use a sheet mask in my AM routine. I don't always use a sheet mask in the AM, but I always use one in the PM. Yes, I sheet mask every day, sometimes twice a day! COSRX 96 Snail Mucin Power Essence- This essence has been in my skincare routine for quite a while now. I absolutely love using snail products, and I try to encourage everyone to try out this fantastic ingredient. One tip I do have for anyone that sheet masks; if you find that your skin feels sticky after using a sheet mask, this essence will solve that problem! Elensilia CPP French Propolis 82 RESISTEM Ampoule- Yes, I like to use an ampoule too. I know my routine may seem very excessive, but I enjoy pampering my skin with skin softening/protecting products. My skin barrier is super strong, and it is very hard to irritate my skin these days. An added bonus of using very nourishing skincare products; my skin looks so young and plump. My daughters pediatrician thought I was in my low 20s! He couldn't believe that I was already 30! Etude House Moistfull Collagen Eye Cream- I don't use any fancy eye creams. This cream from Etude House is perfect for providing intense hydration to the eye area. Honestly, I use eye patches every day, so I don't feel the need to use an anti-aging eye cream. The hydration this cream provides is enough to plump out the smooth lines around my eyes. So far this has been enough for me, but that may change as I venture further into my 30s. Elensilia CPP French Propolis 80 RESISTEM Cream- I can't even begin to explain how amazing this moisturizer is for my skin. If you are looking for that K-Beauty glow, look no further. This Propolis cream is going to transform your skin! I am almost out already, but I bought a backup this month. I don't know how I will live without this moisturizer ever again. Radha Beauty Argan Oil- I always use a beauty oil in my skincare routines. It doesn't make my skin oily, it actually keeps my oil production under control. I use dry oils in the AM and PM to help seal in all my fantastic skincare products, and keep my skin protected from my environment. I love to use Argan Oil in the AM. It is a very lightweight oil, and it helps my skin maintain moisture all day long. I highly recommend trying out this oil for yourself. It may change the way you feel about beauty oils! Australian Gold SPF 50 Face Mineral Sunscreen- My final AM skincare step is always SPF 50. I use a high SPF all year round, and it is so important for everyone to continuously use sunblock. I love mineral sunscreens, but they turn my face ghost white! This sunscreen is tinted, so you won't see the sunscreen film on your skin. It doesn't provide any coverage, so don't expect it to work like makeup. Banila Co Clean It Zero- I always start my PM skincare routine with an oil based cleanser. The Clean It Zero is a super creamy cleansing balm, and I have been using it the past month. I actually think this cleansing balm removes sunscreen and makeup more thoroughly than any other oil cleanser I've tried in the past. I use a small amount for my whole face, and it is even safe to use on eye makeup. This is seriously my new favorite cleanser! Oseque Silky Bright Enzyme Powder Facial Wash*- To remove all of the oil based cleanser, I always follow up with a second cleansing step. This is one of those K-Beauty products that I wish I never tried. It's absolutely amazing, but I can't find it for sale at a reputable distributor! You only need a very small amount of product, so I have quite a bit left. I'm hoping it will last me another 3 months at minimum. Son & Park Beauty Water- If you haven't heard about Beauty Water yet, stop what you are doing right now and buy some. It is one of the best purchases I have made in 2018. It can be used as a cleansing water, a toner, an essence, and a hydrating mist (if you pour some product into a spray bottle). I love how versatile this water can be, and I love that it is formulated with natural gentle exfoliators. I use it as a final cleansing step. I add some onto a cotton square, and then I swipe the cotton over my face. This ensures that I remove every last trace of sunscreen and/or makeup as well as prep my skin for the rest of my routine. COSRX AHA/BHA Clarifying Treatment Toner- I use this in the PM in the same way as the AM. Manyo Factory Galactomyces Niacin Special Treatment Essence*- I use this in PM in the same way as the AM. Dear Klairs Freshly Juiced Vitamin Drop- I use this in the PM in the same way as the AM. Sheet Mask- I always sheet mask in the PM, even if I've already sheet masked in the AM. I have a huge stash of masks to choose from, so I normally select a mask that will benefit my skin at that moment in time. Does that even make sense? COSRX 96 Snail Mucin Power Essence- I use this in the PM in the same way as the AM. JayJun Roselle Eye Patches- I actually just started using eye patches every PM last month. I started with cheaper gold patches, but I've now upgraded to these amazing patches from JayJun. I like to apply these under my eyes right after the snail essence, and let them sit for at least 20 min. Etude House Moistfull Collagen Eye Cream- I use this in the PM in the same way as the AM. JayJun Soothing Facial Moisture Emulsion- This is basically a very lightweight moisturizer. For some people it may be hydrating enough to use on its own, but I use it as a hydration boost under my other moisturizers. I do find that adding an emulsion to my routine in the PM really helps my skin stay hydrated enough throughout the night (even with a heater on full blast). COSRX Ultimate Nourishing Rice Overnight Spa Mask- I apply this overnight mask before my regular moisturizer because I feel that my moisturizer is a lot heavier than this mask. 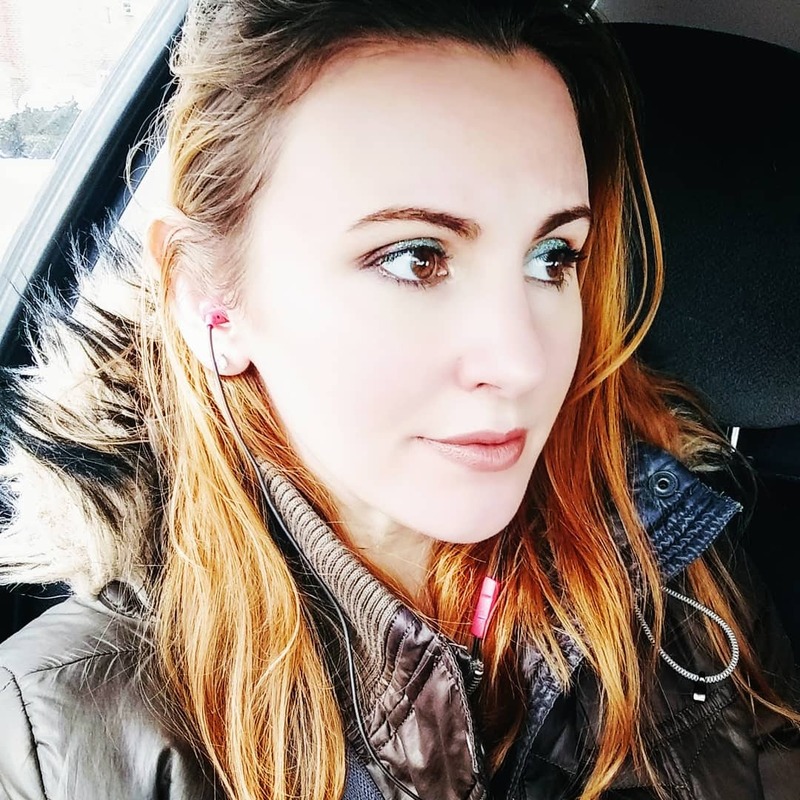 Normally, you would want to add a sleeping mask last in your skincare routine, but I have found that the opposite works better for my specific skincare products. This mask really softens and brightens the skin overnight. I can't believe how few people actually use this mask in their skincare routines. It is absolutely fantastic! Pacifica Beauty Coconut Probiotic Water Rehab Cream- I actually find this to be a dupe for The Water Cream from Tatcha. I actually find it to be a lot more hydrating and beneficial for my skin. I highly recommend checking this moisturizer out. It may save you a ton of money on the Tatcha version. Radha Beauty Rosehip Oil- This is my other favorite beauty oil. I find that it's a little heavier than the Argan Oil, so I only use it in the PM. It helps fade my acne scars, and it keeps my skin glowing. I cannot live with Rosehip Oil! I hope this Skincare Routines Update was helpful! As always, if you have any questions please leave them in the comments below. 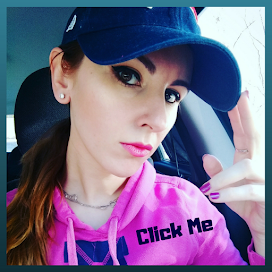 To help support my blog, please subscribe or follow me on Instagram. I will be hosting my next sheet mask giveaway on May 1, 2019 on my Instagram page. So far I will be giving away sheet masks from JayJun, Papa Recipe, and Mediheal. I always give away 10 sheet masks every few months, but my giveaways are for US residents only. 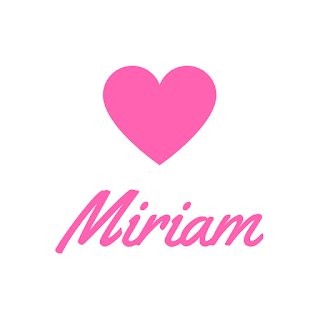 Miriam 2018. Ethereal theme. Powered by Blogger.